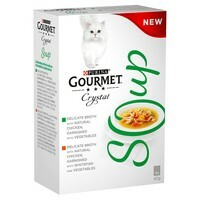 Purina Gourmet Soup with Chicken is a variety of complementary meals served in a delicate and refined savoury broth that will get your cat’s taste buds tingling. Made with real pieces of delicious natural chicken, Gourmet Soup has been cooked to the highest standard to ensure a taste and texture your cat will love. Each soup comes in a 40g pouch so each serving is delicious and fresh, and is full of nutritional goodness to help care for and support your cat every day. For a 4kg cat, pour in a bowl and serve one pouch as a complement to a complete meal. Serve at room temperature and always provide clean and fresh water.